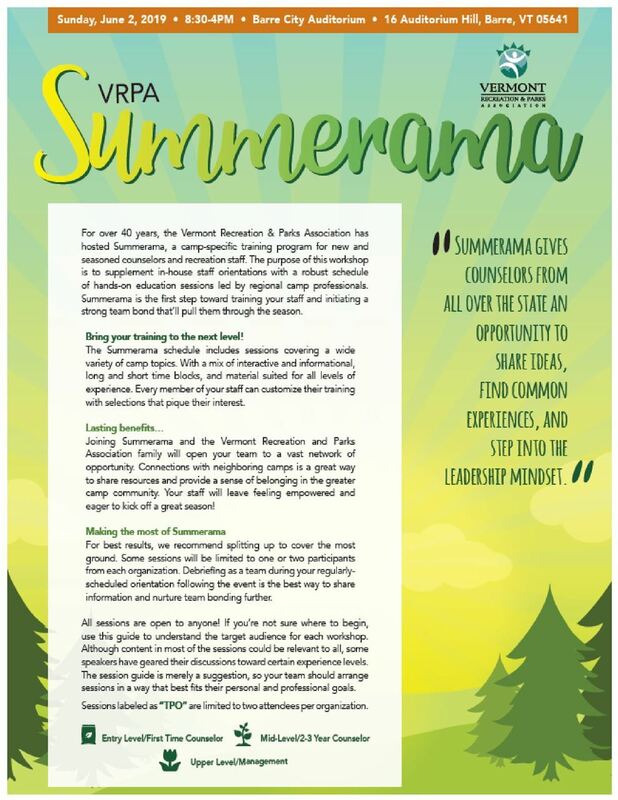 Bring Your Training to the Next Level...The Summerama schedule includes sessions covering a variety of camp topics. With a mix of interactive and informational, long and short time blocks, and material suited for all experience levels, every member of your staff can customize their training with selections that peak their interest. This year's Summerama will be held on Sunday, June 2, 2019 at a location yet to be determined...more details coming soon. In 2010, the Vermont Recreation and Parks Association brought back the Maintenance Workshop; it had been eleven years since the last VT/NH Maintenance Workshop. 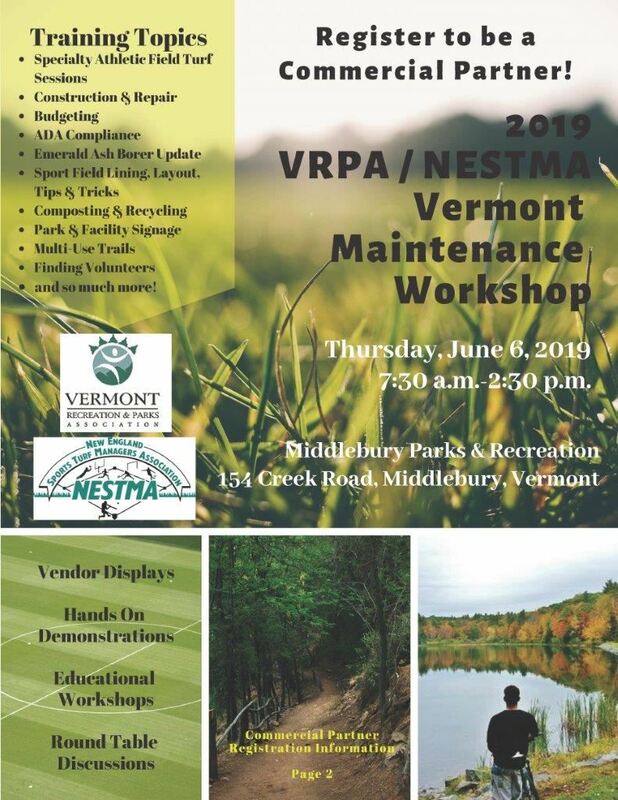 In 2011 we began a collaboration with the New Hampshire Recreation and Parks Association (NHRPA) and NESTMA (New England Sports Turf Managers Association) to re-introduce the VT/NH Maintenance Workshop. The Maintenance Workshop is designed specifically for the men and women who take care of our parks and athletic facilities. In recent years the morning has been dedicated to site visits and hands-on workshops and the afternoon to facilitated best practice roundtable discussions. In 2019, VRPA and NHRPA will each be hosting a Maintenance Workshop. 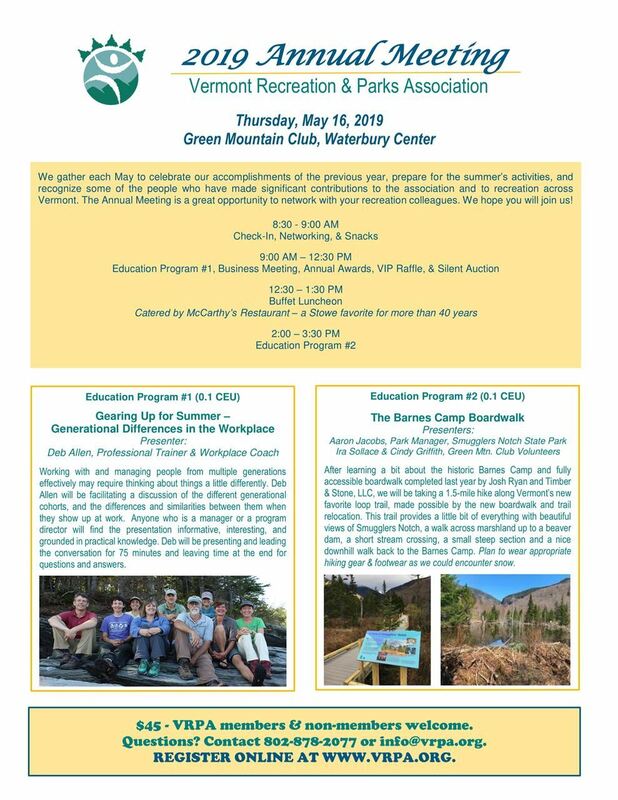 The Vermont Maintenance Workshop will be held on Thursday, June 6, 2019 at the Middlebury Recreation Center. This workshop is a great way to meet people from around the state who work in park and school settings and face similar challenges. 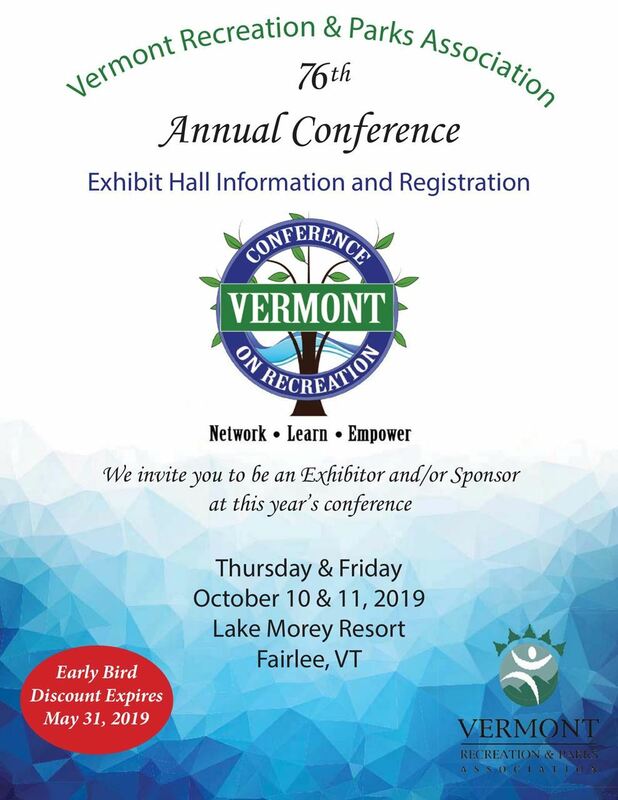 Hosted annually by the Vermont Recreation and Parks Association. Our next CPO course is scheduled on Tuesday & Wednesday, March 26 & 27, 2019. The Certified Pool Operator® certification program is a nationally recognized course which teaches advanced techniques in safety, water chemistry, maintenance, and management. This course is recognized as the standard in the industry. The CPO® seal of approval is assurance to pool and spa owners that their facilities and their swimmers are under the supervision of trained certified professionals. Those who complete the program and open-book examination receive certification which is valid for five years in all 50 states. CLICK HERE for more details and to REGISTER ONLINE. Who should attend the CPO course? Recreation directors, maintenance personnel, aquatic staff, recreation facility managers, service technicians, apartment/condo managers, health inspectors, and anyone else responsible for taking care of a pool, spa, or aquatic facility in a recreation center, health club, school, university, motel, etc. Hosted by the Vermont Recreation and Parks Association every three years. Our next CPSI course will be scheduled in the spring of 2020. The Certified Playground Safety Inspector (CPSI) is a 15-hour comprehensive training program on playground hazards identification and risk management methods, offered by the National Recreation and Parks Association. Attendees have the option to site for the CPSI examination scheduled at the culmination of the course. Upon successfully passing the exam, you will be certified through the National Recreation and Parks Association as a Certified Playground Safety Inspector for a three year period. 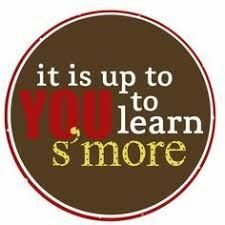 The CPSI course provides the most comprehensive training program on playground safety anywhere. Who should attend the CPSI course? Administrators, supervisory personnel, public works department staff, planning department staff, buildings and grounds maintenance staff, engineers, architects, playground equipment representatives, operators and caretakers of playgrounds in parks, schools, summer camps, day camps, homeowners associations, hotels/resorts, childcare centers, and agencies such as the YMCAs, YWCAs, Boys & Girls Clubs.